VIDEO: The Spiritual Significance of the Aleph Tav. The Messianic Aleph/Tav את Scriptures (MATS) was written to be a Study Bible and is the most unique rendition of the Tanakh* (Old Testament) Bible of its kind in the world. Unequivocally the greatest symbol in biblical history since it was revealed by the Apostle John is the Aleph/Tav את Character Symbol. It is the HOLY GRAIL OF THE SCRIPTURES and the reason is because it unlocks the mystery to the greatest treasures man can ever hope to comprehend from the Scriptures. This re-discovered character symbol has been hidden in plain sight from the beginning, starting with the original Paleo-Hebrew scrolls written by the hand of Moses and the Prophets, then copied by the Scribes for thousands of years thereafter into Babylonian and finally Modern Hebrew. The Aleph Tav was not translated by the composers of the King James Bible because it was not considered a word but a “mark”. This second edition of the English MATS version of the Tanakh is the final exhaustive rendition, which incorporates all of the Aleph/Tav את Symbols into the English sentence structure exactly where Moses and the Prophets originally placed them in the Hebrew scroll. In addition, this MATS edition also focuses on the Aleph Tav in association with other single Hebrew letters as both prefixes and suffixes. This Study Bible will reveal that the extension of יהוה (Father’s Memorial Name forever) is both WITH and THROUGH the workings of את Y’shua ha-Mashiach (the Messiah), who is ONE with יהוה Father and by whom everything has been created and established from the beginning, just as proclaimed in the Gospel of John 1:1-3. 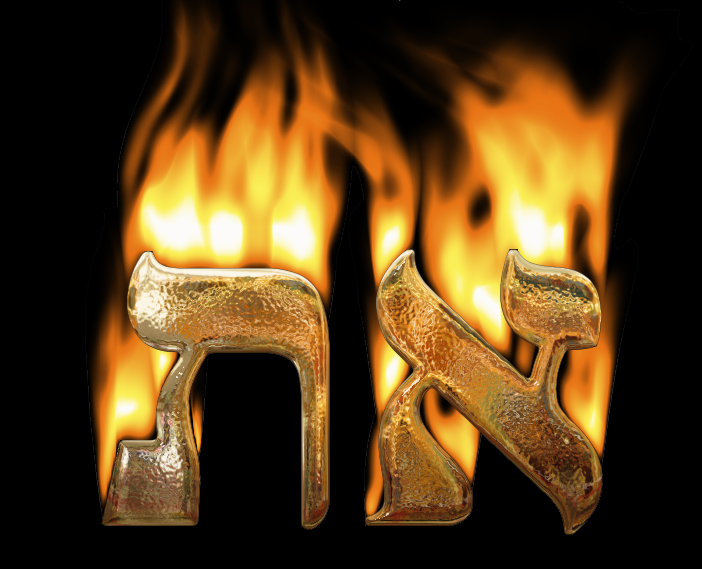 Quite simply, the Aleph/Tav את Symbol is so important to today’s covenant believer that it merits its own rendition of the Tanakh into English for the purpose of being able to study its placement in text and gaining a deeper understanding of the workings and structure of what I have come to call the “Yah-head” which is the working of both Father (Yahuah) and the Son (Yahusha) together as ONE (Elohim). Many Hebrew scholars agree that originally in Paleo-Hebrew the first letter of the Aleph-Bet, the Aleph (a) letter meant “Strength.” Its letter symbol was originally an Ox Head. The last letter of the Aleph-Bet is the letter Tav (t), which Hebrew scholars agree was originally in Paleo-Hebrew as a symbol or sign of “Covenant.” Its original symbol was an X. Consequently, it is believed that the Paleo-Hebrew Aleph/Tav ta Symbol literally meant “Strength of the Covenant” when used in original Hebrew text and was placed to create emphasis as a direct object pointer to the workings of the Yah-head (both יהוה את) concerning the covenants, wherever it was placed throughout the Tanakh. 2. MATS also has nearly 300 Messianic Prophecies fulfilled by Y'shua the Messiah in the Brit Chadashah (New Covenant) listed after each pertaining verse in the Tanakh (OT). 6. MATS is truly the perfect gift for the believer who desires a deeper understanding and revelation of the manifestation of Y'shua our Messiah in relationship with our Heavenly Father as revealed by the original Hebrew text.